For <$300 per pair, these are really an astonishing value. They have a level of sophistication and refinement that is rare at this price point. The high end is extremely smooth and with good detail, open midrange, and surprisingly propulsive bass. They don't project a massive soundstage or have state of the art detail that truly hi end speakers possess, but they image very well, and are largely free of box colorations that plague many speakers in this range. They also have a relaxed, laid back character, but the bass does have some boogie to it. All in all, hard to quibble at this price point. Primus 160 is definitely the best bang for the buck. Bass is very tight, Air, good spatial rendering, and for a bookshelf size, punches a wallop, please if you are into heavy bass, then you need to go for tower speakers or subwoofers, but for very good music/stereo audio, this is definitely a very good buy. Bass response rated to 49 Hz. which is extraordinary for bookshelf speakers. DVD voice dialogue reproduction is quite good. Clear, clean and good response throughout their frequency range. Nothing to complain about considering price. Lets get right to it. . . no regrets! They sound great and offer good value at their price point. Bought them in April '04 after a complimentary Stereophile magazine review of their little brother the Primus 150. Had been shopping around for a while looking at Klipsch, PSB, JBL, Bose, Athena among others; almost purchased Athenas but in the store the Primus 160s sounded a little better to my ears. I use them with a 2 channel DVD/CD player and also have a turntable. I usually use the virtual surround mode from my JVC 70 watt stereo receiver and music is clean and clear; DVD home theatre sounds robust and impressive. Give 'em a listen. Very detailed stereo image, crisp sound without beeing too bright, good low end for a bookshelf, sweet sounding speakers. none, unless you're really picky. Based on reviews, I was planning to buy the JBL's S26II but when I went to the store I saw these speakers and decided to give them a go. Well, I've compared them side by side with the S26II and they sounded much better to my ears. I'm used to listening to music on studio monitors, like the Alesis Monitor One MKII and JBL Control 5. I've always found the JBL model lacking in the low end department and a bit too bright to my taste. When listening to the S26II, I found their sound quite similar to the Control 5's. They deliver a quite open and bright stereo image, lacking some of the low end you would expect from speakers of this size. Now, the Primus 160 sound very different from the S26II. They deliver a more dense, sweeter and well balanced sound, with a not so widespread stereo image. I'd say that their sound have some more weight to it. 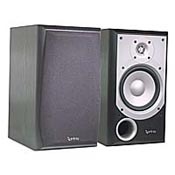 They also have more low end than the S26II, but, in any case, a subwoofer is recommended. The sound of both models is crisp and detailed, and in the end, it may be a matter of personal taste. But don't buy any of them without comparing to see which fits your preference better. I've paired the Primus 160 with a PS-10 sub and I'm very happy with my choice. Based on reviews, I was planning to buy the JBL's S26II but when I went to the store I saw these speakers and decided to give them a go. Well, I've compared them side by side with the S26II and they sounded much better to my ears. I'm used to listening to music on studio monitors, like the Alesis Monitor One MKII and JBL Control 5. I've always found the JBL model lacking in low end department and a bit too bright to my taste. When listening to the S26II, I found it's sound quite similar to the Control 5's. It delivers a quite open and bright stereo image, lacking some of the low end you would expect from a speaker of this size. Now, the Primus 160 sounds very different from the S26II. They deliver a more dense, sweeter and well balanced sound, with a not so widespread stereo image.I'd say that it's sound have more weight. They also have more low end than the S26II, but, in any case, a subwoofer is recommended. The sound of both models is crisp and detailed, and in the end, it may be a matter of personal taste. But don't buy any of them without comparing to see which fits your preference better. I've paired the Primus 160 with a PS-10 sub and I'm very happy with my choice. Great Highs and lows.Crisp clear sound,i hear things in a song i have never heard with any other speaker i have used. I don't know why the first person gave it a bad review,either he has a terrible reciever,or just really really picky.These speakers really sound crisp.Great highs and lows,person also above mentioned the speakers dont perform well when cranked,not true i have cranked mine up no problems.Sounds great when watching movies.Also got them for a decent price.I used to have a pair of pioneer small towers,my primus 160s puts my old pioneers to shame. Just average, decent sounding bookshelf speakers. Too expensive.Just plain old bookshelf speakers of average quality ,same as those of last twenty years. This product is mediocre for it's price. My Pioneer BHK 153's (6 1/2") bought at Circuit city are a much better sounding/imaging bookshelf pair, and at 1/2 the price. Even coupled to my new 150 watt RMS Harmon Kardon HKSUB 12" they are lacking in room filling mid-range imaging.All the hoopla about Ceramic metal drivers is bunk.Polk R-20's are superior in my opinion.Save your money, don't but metal matrix speakers.It's just PR in my opinion.These speakers break up badly with 8 db bass boost at higher volume levels,just as with any other 6 1/2 speaker. I just got these speakers for Christmas and they sound great for the amount of money that I paid. They will hit all of the highs and supprisingly a great deal of lows out of these little bookshelf speakers. I am using a almost 30 year old reciever and they still sound amazing. These speakers will provide enoungh power for a very large room yet not too much to make it unbearable to listen to. These are by far one of the best bookshelf speakers under 300 that I have ever heard.